Team InterCoastal Net Designs is thrilled to announce the launch of our newest vacation rental website for Seaside Vacations of North Myrtle Beach. 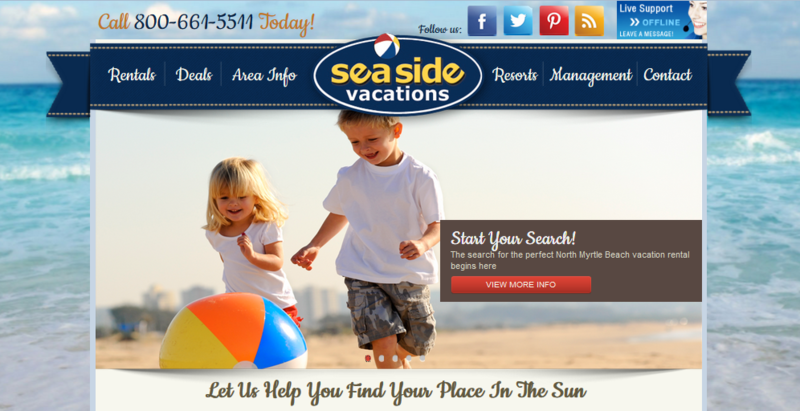 We’ve worked with the team at Seaside Vacations day in and day out to ensure everything on this site is up to industry standard. The design is bright and inviting, making it hard for any potential customer not to stay on the site and browse a while. Along with the modern design, this top of the line website features a responsive design, booking engine integration and custom content management system. The experts at ICND find it imperative for new site launches to be responsive, allowing users to view the site fit to the screen it’s being viewed on. Users can even book from their smartphone! See the below screenshot representing the look that our new responsive booking engines have. Behind the scenes, the website will have a Leadtracker allowing our client to manage leads with a main focus on converting them to bookings. The content management system is custom to their needs as well and user friendly. Seaside Vacations has been a joy to work with and we are excited about growing our partnership. If you are interested in learning more about our modern, completely custom vacation rental websites, contact us today! Next Next post: One Year of SEO, Double the Traffic!